La Puntilla Puerto Vallarta Dive Site - Save 15%! Not far from Mismaloya exists La Puntilla, one of the few good shore diving areas in Puerto Vallarta. Entry to the water is easy, with a sloping bottom dropping to 80 feet. 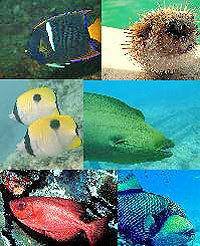 There is a wide variety of tropical fish here, including angelfish, porcupine fish, and green moray eels. Keep an eye out for spotted eagle rays!